Jordan Spieth and Michael Greller have developed a bond rare between golfer and caddy. Might have been worth at least one stroke over four days at Greller’ hometown course. UNIVERSITY PLACE — So many new frontiers were crossed in this U.S. Open that the record set in the conclusion Sunday was only a modest surprise: Most times for a tournament outcome falling off a cliff, and climbing back up. First man to the top was Jordan Spieth, who is young of leg, stout of heart and local of bag — essentials in surviving Torture Chambers Bay. His caddy, Michael Greller, a former University Place teacher who lives in Gig Harbor, was married on the course two years ago. Sunday, he and Spieth were married forever in local and national sports history — at 21, the youngest man since Bobby Jones in 1923 to win the Open, and perhaps the most complete athlete at 21 that the marketplace has seen since another Kid, Ken Griffey Jr.
A caddy’s knowledge has no metric, but it stands to reason that at least one stroke across these four days of controversy, elation and despair must have had a hometown edge. One stroke was the difference between Spieth, Dustin Johnson and Louis Oosthuizen in one of the most preposterous half-hours to close a major golf tourney. After Johnson three-putted from 12 feet on the 18th green, the final gaffe in a string by the contenders that will put him with Bill Buckner in the pantheon of sports pratfalls, Spieth offered a post-match observation. Johnson ran out of tournament. Faced with a 12-foot eagle opportunity for the outright win, or a four-foot birdie to force an 18-hole playoff Monday, Johnson managed neither. He had a great chance to win and came up a yard short. What is it with this marketplace and that theme? 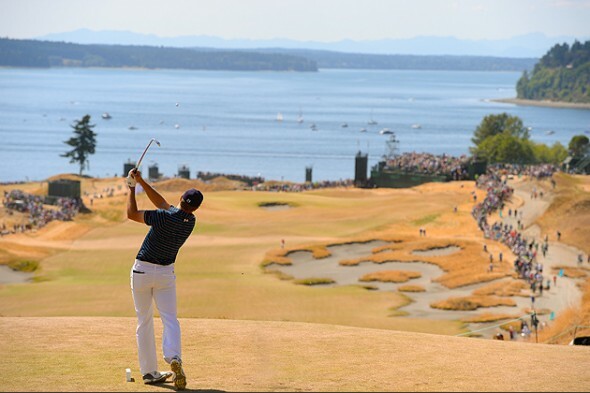 Regardless, Spieth and Greller managed to get some privacy just off the 18th to watch Johnson implode on TV, as Spieth appeared to do at 17 and fellow contender Branden Grace did at 16, when he sent his tee shot nearly to the railroad tracks that run along Puget Sound. The bro-hug represents what good caddies are for — less about distance and club and more about focus, patience and emotional support. The intense connection between the pair apparently is important. These are two smart, cool cats, enough apart in age (Greller is 37) that the mentorship is understood, but not so much that there is a generational gulf. As Chambers Bay staggered one contender after another — whether by design or greens malfeasance is a conversation for another day — Spieth and Greller stood up to the predations better than anyone. “(Greller) kept saying, ‘We’ve done this before, and they haven’t,” Spieth said. He was right — they won the Masters. Now they’ve won the U.S. Open. Only six other golfers can say that in the same year, and all of them are Hall of Famers –Craig Wood (1941), Ben Hogan (1951, 1953), Arnold Palmer (1960) and Jack Nicklaus (1972) and Tiger Woods (2002). The Open coming to the Northwest for the first time was history. So was the course debut on the national stage — the first new course introduced to the Open since Minnesota’s Hazeltine in 1970. Spieth, and his Robin, Greller, made their own history, surviving jaw-dropping twists on an eye-popping course to become instant international celebrities. They will be feted at the next major, the Open at St. Andrews in the UK, in July. Set aside the caterwauling about the course for a moment and consider the good fortune to having been witness to a star going supernova. No one else can either. But we’ll be happy to talk about it for years, dudes. One thing that was annoying was that every time a player would complain about the condition of the greens, there was this obstinate outcry of “Boo! Everyone has to play on the same greens, jerk!” The greens totally sucked, OK? Lets just all agree on that. It was kinda like if the tire supplier for a NASCAR race said “Sorry guys, but this week 25% of the tires turned out kind of square-ish, so everyone is going to run on three round tires, and one kinda squar-ish one, just so we keep things fair.” I don’t think it a mystery to anyone that the greens need to be better when the Open returns. Also, I wonder how Gary Player feels about 3 of his countrymen finishing in the top 7. Apparently, they didn’t find the place as tragic as he did. Glad you took it in. And your point about the greens is largely true, but it’s not the first course to draw complaints from PGA tourists. They do need a better solution to get a second chance, but in this case, my guess is the course operators, seeking firm and fast, let it get too dry, not anticipating the current drought. Conditions six weeks earlier were more reasonable. Beyond that, I thought the course and the tournament were amazing. It looked great on TV. With all the environmental and water usage issues looming in the future, I think we might look back on CB as a forerunner to where the sport is headed and where and how courses are built. No more doing major redevelopment of land by bringing in non-native landscapes supported by tons of chemical fertilizers and hydrated by millions of gallons of water. I’ve tried to encourage Seahawks fans to start laughing about it. It’s the main way forward. You have an enlightened view of CB, Jamo. Many first-timers were put off by the industrial esthetic. They think all golf courses look like Augusta. And they don’t understand links courses nor resource management. bill buckner? how about pete carroll, darrell bevell, russell wilson, and ricardo lockette? the redsox actually had another chance to win the series after buckner’s error, unlike dustin johnson and the seahawks. also would like to hear how spieth and the caddie hooked up. Difference: The Hawks were going for a repeat, while the Red Sox were in Year 69 of the Curse of the Bambino. Stakes were much higher for Buckner to reverse history, versus the far more common championship repeat. As for the greens, are they a mixture of two different grasses? If so, that likely explains the bumpiness. I was referencing a single act, not comparing stakes. Plenty of analogies, but Johnson and Buckner simply had to do the single thing for which they had trained for and executed many times. As you wrote, many were involved in the Seahawks blunder. Greller caddied for Spieth at an amateur event in 2011 at Gold Mountain GC in Bremerton. Pure random.